In the summer of 1948, a woman riding in the remote, mountainous region known today as the Kalmiopsis Wilderness was seriously injured when her horse slipped over a steep embankment and rolled over her three times as they fell down a rocky slope (1). When word of the accident got to Cave Junction, it was decided the quickest way to get help to her was to fly two smokejumpers from the Siskiyou Smokejumper Base and parachute them into the accident site with a stretcher to carry the woman out. The following account was given by Bob Nolan, a long time resident of Cave Junction, and one of the two who were selected for the rescue mission. At about two o’clock in the afternoon, the smokejumper plane arrived at the narrow ridge where the injured woman and other members of the women’s riding club waited. This was near to a peak called Hawks Rest, about 10 miles directly west of Cave Junction (3). Nine members of the club, the Rough and Ready Ramblers, were on the sixth day of a backcountry ride when the accident happened (1). Bob jumped from the plane and as he came down, a gust of wind unexpectedly swept him over the ridge and down a steep canyon where his parachute finally snagged the top of a tall tree located about a mile below the ridge. Nolan and Marshall jumped to the site of the accident from a Noorduyn Norseman. Crew photo taken in 1948 shows Nolan and Marshall with white shirts, center of back row (Nolan has hands on hip and Marshall has hands behind back). 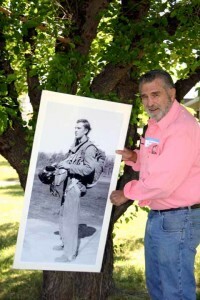 Bob detached himself from the parachute and climbed down his let-down rope only to find the end of the rope was more than 20 feet above the ground with a large pile of boulders beneath him. He would be seriously injured if he let go. He saw some manzanita brush on slope about eye level to where he was hanging and decided to swing and try to land in them to cushion his fall. He did a good job of calculating the distance but his release was a little late and caused his feet to go up so he crashed into the brush flat on his back. His landing forced open the branches of the manzanita which snapped back on his body like the jaws of a trap. It took more than a half hour before he was able to struggle free from the vice-like grip of the bush. Once free, he headed up the steep slope and climbed nonstop to the ridge. When he arrived, the crew boss, Cliff Marshall, who was anxious about the urgency of getting the victim to a medical facility, told him to pick up one end of the stretcher and they headed down the trail with no chance for Bob to catch his breath. Cliff Marshall (center front). 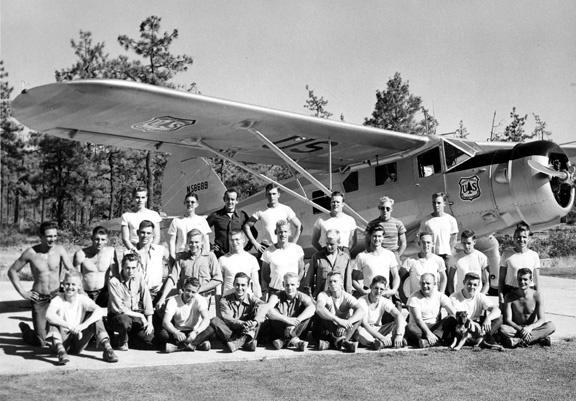 Photo taken circa 1948, Siskiyou Smokejumper Base. Their destination was a road on Tennessee Mountain about eleven miles away where an ambulance would be waiting to take the woman to Grants Pass (1). They carried the woman over steep and rugged terrain, all the time unable to put the woman down on the ground because of the pain to her badly bruised body. She had a broken ankle but the smokejumpers thought she may have also had a crushed hip. They were able to take turns resting by setting one end of the stretcher on a log while one stood and held the other end. When they jumped in to the site the only thing they brought with them was a stretcher because they were told a separate rescue party would walk in on foot with food and water. The temperatures were high, there was no water along the trail, and as it got dark, they had the added predicament of having no flashlights. Soon they were unable to see the trail in the darkness. Bob Nolan, 2006. Siskiyou Smokejumper Base reunion. It was close to midnight when they saw the lights of the rescue party hiking in from Tennessee Mountain. It is estimated they had carried the woman about eight miles over steep terrain and under the heat of the summer sun. The rescue party arrived at the Tennessee Mountain road at midnight (2). After all he had been through, Bob was expected to get up the next day and return to retrieve his parachute and jump gear from the top of the tree more than eleven miles of hiking distance in the steep canyons of the upper Chetco River watershed. 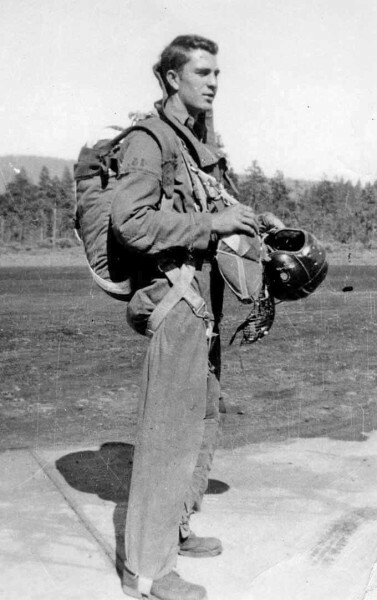 Fortunately, one of the other crew members volunteered to do it for him so he would have a day to rest and get back to his job as an aerial fire fighter at the Siskiyou Smokejumper Base (3). 1) Grants Pass Daily Courier, June 17, 1948. Mountain rescue – Forest Service jumpers reach injured woman. 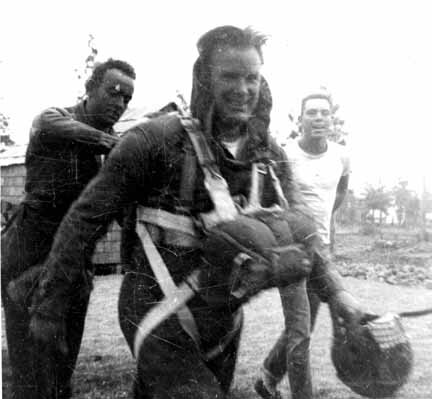 4) Smokejumper base operations records summary, 1958. Annual summary of operations and jump records from 1943-1958.